Friend and chef-owner Turi Sigilato of the famous Osteria Nero d’Avola in Taormina, has moved to a new location. 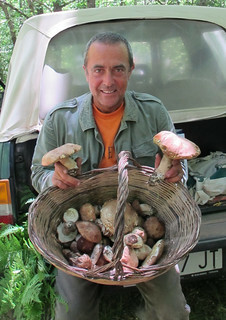 Besides being a fan of mushrooms, he is a fanatic hunter and also a great ambassador for all wine estates on Etna.A good “excuse” for trying the new cuisine and celebrating Turi’s new place with a vertical tasting of Magma®! 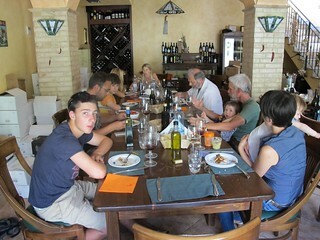 Journalist, food critic and photographer Jean-Pierre Gabriel and his family joined us for this special lunch. 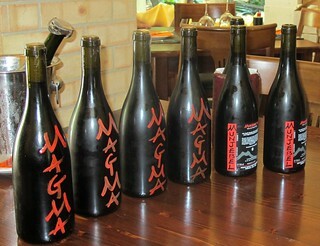 As Jean-Pierre was here for a reportage on my 10 years of wine producing, I selected 5 vintages of Magma®, to show what I call my 3 evolution periods in my winemaking without corrections: the initial and provocative period of “liquid stone” (2001-2003), the transition to search for equilibrium and expression of terroir (2004-2008) and the actual period of putting all details together in order to produce great terroir wines (2009-…). -MunJebel Rosso® 9“VA” of the 2011 vintage, from our 3 highest plots in contrada Barbabecchi, Guardiola and Tartaraci. Pure Nerello Mascalese expressing drive and density in a great vintage for the high vineyards. Just bottled. -MunJebel® Rosso 9 “MC” of the 2011 vintage from our steepest vineyard in contrada Monte Colla. Pure Nerello Mascalese on sandy clay, brittle rock. Dense and fresh with strong tannins becoming well integrated. Just bottled. Turi served a series of antipasti based on vegetables, going wonderfully well with the first two wines. One I liked very much was the “fiore di zucca” with a fresh tuma cheese and anchovies. A perfect and delicate combination. -Magma® Rosso 2 “T” of the vintage 2002, from contrada Trefiletti in Rovitello. My second vintage produced and by far my most evolved wines. This is pure stone as I wanted to by-pass the fruit. Very stony and astonishingly fresh. Colour changes rapidly into a dark ash. -Magma® Rosso 3 of the vintage 2003, from our Barbabecchi vineyard in Solicchiata at 910m. asl. One of our worst and rained down vintages where only the grapes in this plot kept well, picking early November. Although the volatile acidity is sensible, it is a beautifully balanced wine, produced in an archaïc way. A surprise for me. A series of antipasti based on fish were served and especially the “ricci” were exquisit. -Magma® Rosso 5 “R” of the vintage 2006, from our Barbabecchi soprano vineyard at 1.010m. asl in Solicchiata. Opening the bottle is was corked… what a shame. It is sad that a great bottle can be ruined by natural cork, even though we pay a small fortune for top notch corks for Magma. We tasted the wine and one could grasp the incredible density of this wine in the hot 2006 vintage. -Magma Rosso 6 “VA” of the vintage 2007, from our Barbabecchi vineyard at 910m. asl in Solicchiata. A very pale coloured wine with immense aromatic density. What a contrast in a wine. Evolved colour, oriental spices, licorice, and an enormously long aftertaste. The initiation of implementing small details in vinifying shows well in this wine through intensity and precision. Turi served pasta with “ricci” which was perfect to accompany the 2007 Magma®. What a combination! Last but not least, Magma Rosso 9 “VA”of the 2011 vintage, en primeur. A potentially great vintage where everything fell into place. Density, fragrance, tannic structure. All accumulated experiences of winemaking without corrections packed in a bottle. Very promising. Thank you Turi for this wonderfully simple and delicious lunch! This entry was posted on Friday, July 20th, 2012 at 12:32 pm	and is filed under Impressions & Experiences, Work in Progress. You can follow any responses to this entry through the RSS 2.0 feed. Both comments and pings are currently closed.